Our next two stops allowed us to continue to feed our roller coaster addiction. First we stopped at a nice state park in Wisconsin, about 40 minutes from Chicago’s Six Flags Great America. A friend of ours happened to be visiting family in Wisconsin at the same time, so we invited him to check out the coaster action with us. 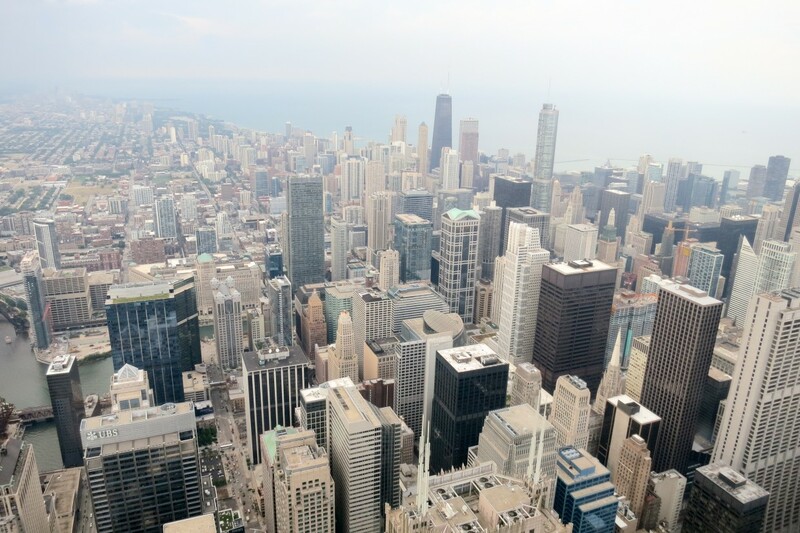 Chicago, from the top of Willis Tower. 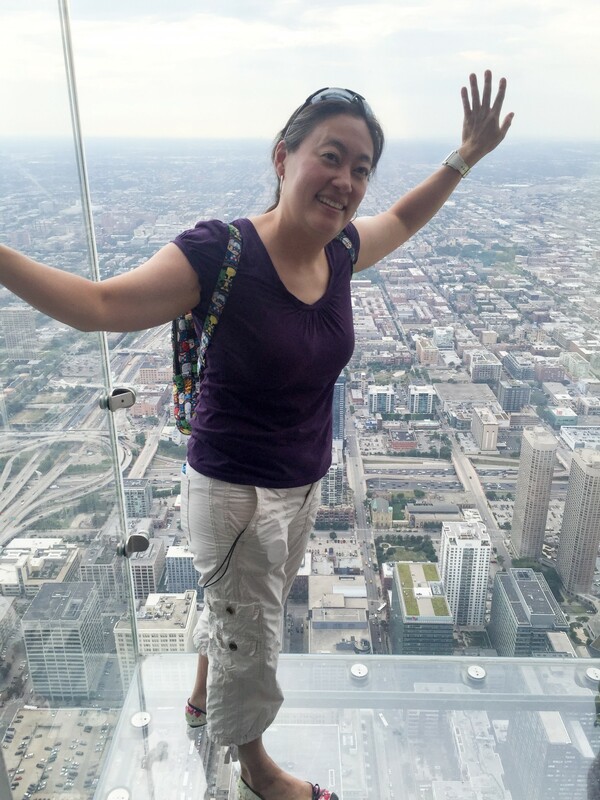 To start out our adrenaline packed trip, we met our friend at Willis Tower (formerly Sears Tower) to check out the Skydeck, located on the 103rd floor of the building. 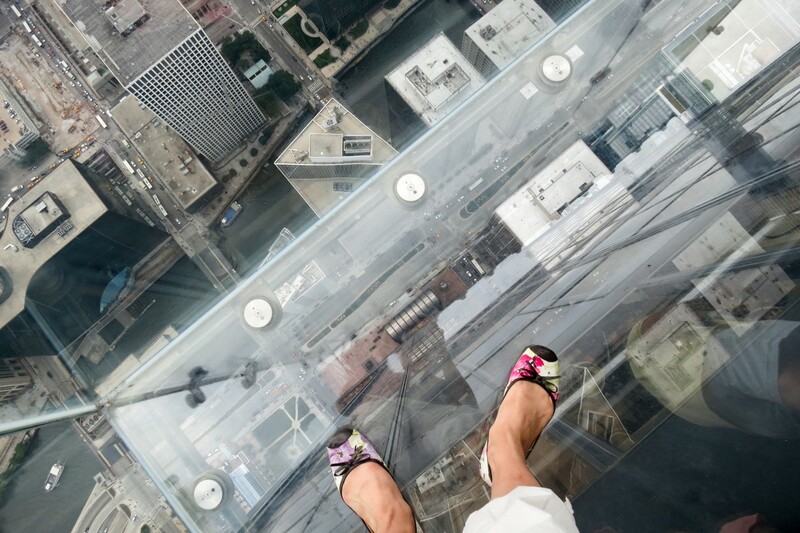 The Skydeck also has the Skyledge, a glass box that extends 4.3 feet out from the side of the building, 1,353 feet off the ground! The view was a bit hazy but still breathtaking. We took turns stepping into “the box” and enjoying the views, both around and below. It’s a loooong way down! Since we were still in busy season for amusement parks, the lines at Six Flags were longer than we prefer but we were still able to ride some pretty amazing coasters. I think the three of us agreed Goliath by far surpassed the other coasters at the park. Goliath, built in 2014, currently holds 3 world records for wooden roller coasters: longest drop (180 feet), steepest drop (85 degrees), and fastest (72 MPH). 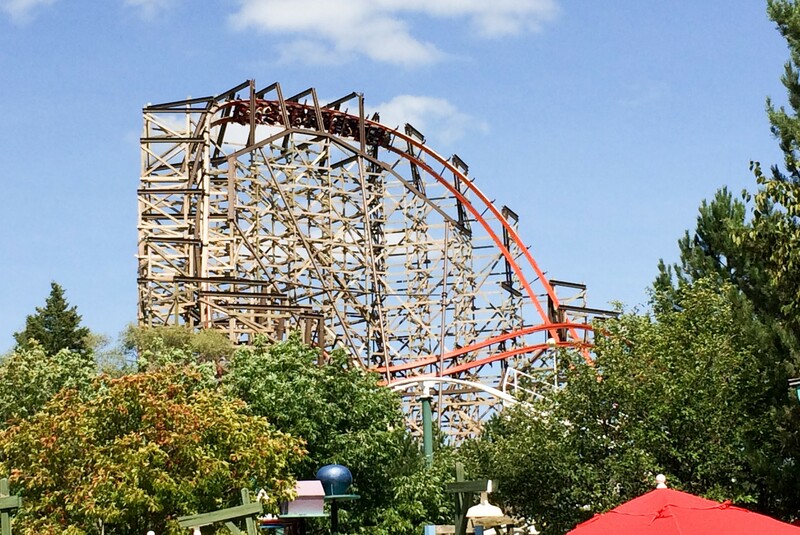 This is the first wooden coaster we’ve ridden that has inversions and overbanked turns making for amazing thrills. I’m pretty sure my eyes were the size of saucers, and my grin extended from ear to ear after leaving the ride. Goliath, probably the most impressive wooden coaster we’ve ridden. I was also very impressed by X-Flight, a steel wing coaster, where the seats are located next to the track. This was our first wing coaster experience, and it is a bit different. Dive drops and rolls feel faster, and the lack of a track below or above you adds to the freaky sensation of being imminently flung off. The X-Flight wing coaster was a little scarier than most. We also hit Batman, a suspended coaster (always wait for the front seat for suspended coasters, it’s the only way to do it right), Raging Bull, a nice steel coaster, and Giant Drop a 227ft drop tower. 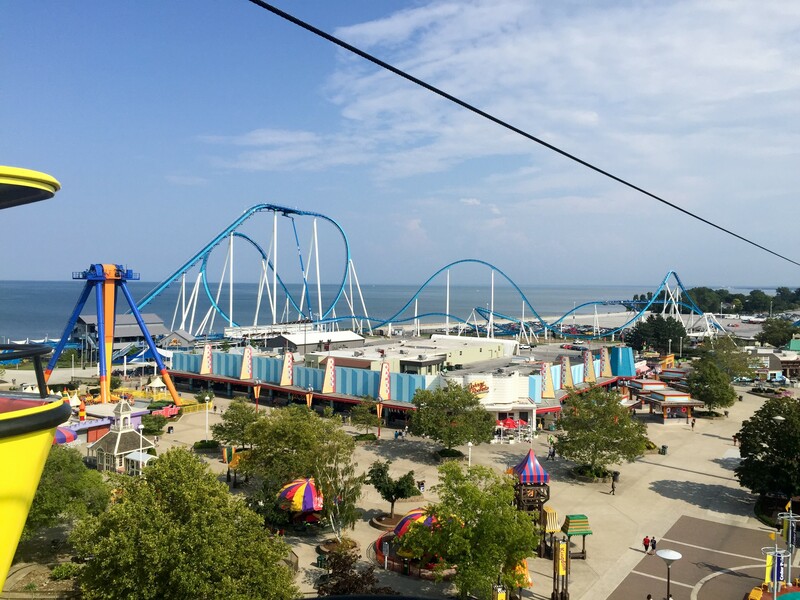 Less than two weeks later we arrived at Cedar Point (known as the roller coaster capital) in Sandusky Ohio, right on the shore of Lake Erie. This has been one of the anchors of our trip planning… when we turned east from Seattle, this was always our ultimate destination. We planned it far enough in advance that our friend Gray was able to drive out from Rhode Island to join us. 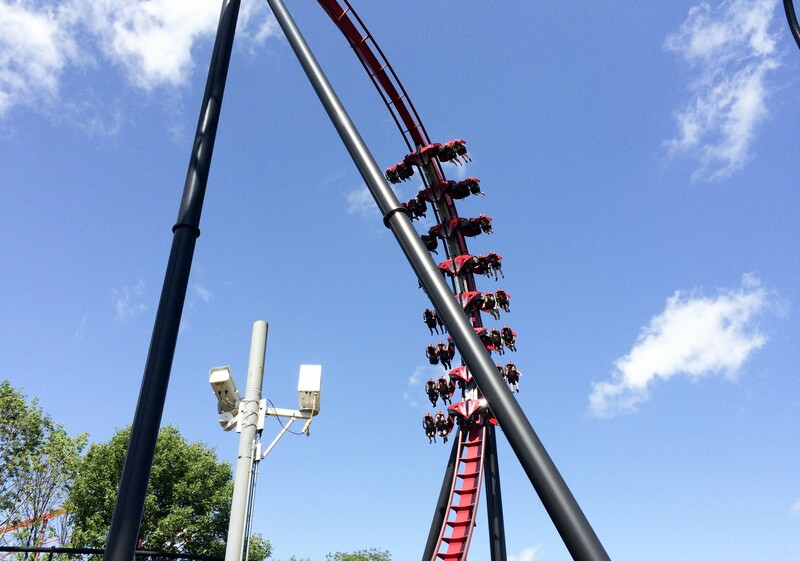 If you are a roller coaster enthusiast, CP should definitely go on your list. The best part is that CP has a pretty nice campground on-site. Although it was pricey, it meant we could walk from the rides back to Rover during the day to take Opie out for a walk, so we wouldn’t feel rushed like we do at other amusement parks. It also meant we got one hour early entry to the park, which turned out to be a huge benefit! It’s a short walk from the campground to the rear entrance to Cedar Point. With early entry to the park, we were able to ride the most popular rides (which usually have the longest lines) with almost no wait at all. In just that first hour before “the masses” entered, we got five rides in! That’s more than we got our entire first day at Magic Mountain in California. 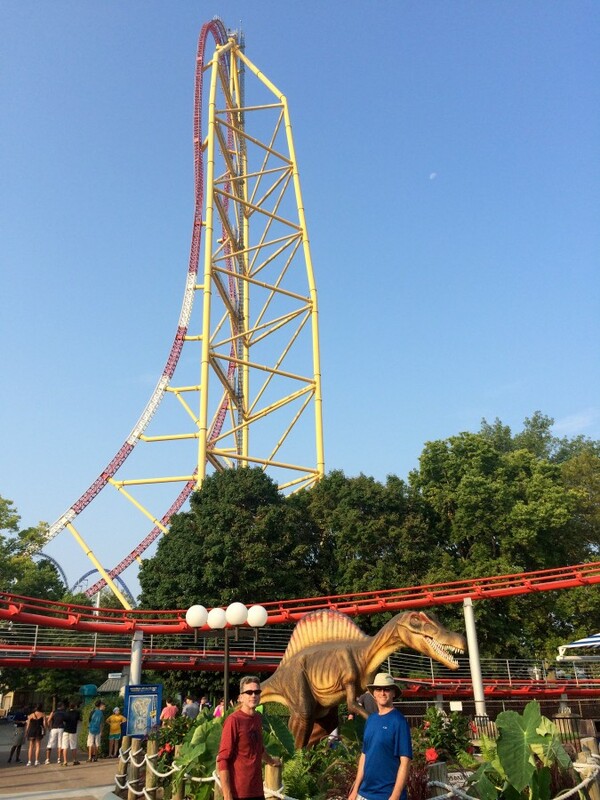 Our first was Top Thrill Dragster, a hydraulically launched coaster that goes from zero to 120 MPH in 3.8 seconds. When you sit in the front, you can literally feel your cheeks flapping. After getting up to speed, your momentum carries you up the 420 foot hill and back down the other side. It’s over quickly but the experience is pretty amazing. Other highlights of the day were Millennium Force, Magnum XL-200, Maverick, Raptor, and Rougarou. Millennium Force has been our favorite coaster since it opened in 2000. It’s also been voted best coaster in the world almost every year since it opened (including winning again in 2015), an impressive feat for a now 14-year old coaster! The 310 foot first hill can be seen at the left side of the photo below. Looking over the park from the aerial tram. 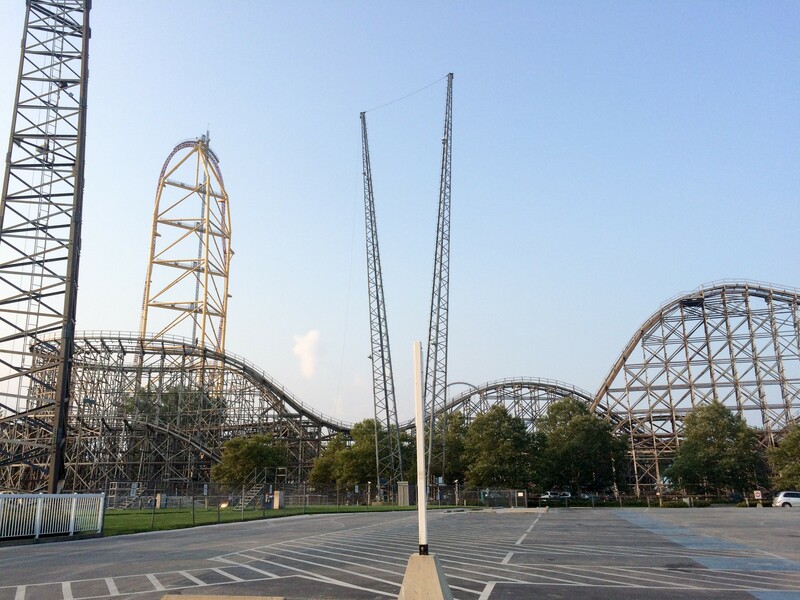 We try to hit Cedar Point Park every 3-5 years due to all the awesomeness, but this was one of the few times we hit the park at low season. Not only did we get to enter an hour earlier than the general public, but the lines in general were short enough that we could ride everything we wanted multiple times and finish by 6pm. It was a gooooood day. 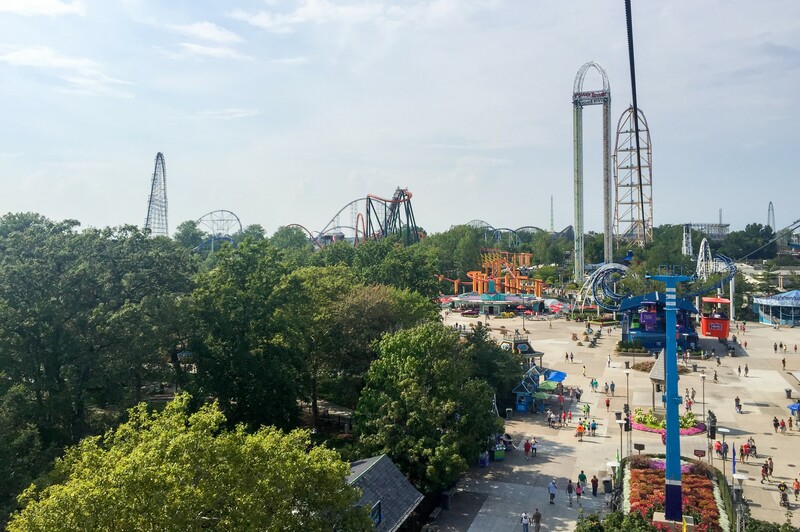 Cedar Point is an awesome park, and I’m lucky to live nearby. I /love/ Millennium Force. Another good campground that is nearby is Crystal Rock Campground – it’s maybe about 15-20 minutes west of the park. The first time I rode Top Thrill it broke down as we were about to get on in the station. It was a bummer, but we got exit passes so the next time we didn’t have to wait in line. I haven’t been to the park this year though – busy summer. Next year I have to go though with the new coaster coming and all. Glad you had a good time. Hi Doug, thank for the tip regarding Crystal Rock, it’s always good to know the optional campgrounds. I have to admit I’m a little jealous that you’re so close to Cedar Point. We only hit it every few years. First time for Top Thrill it was the same for us. It was opening weekend and we ended up waiting in line for a few hours since the train kept breaking down but it was totally worth it. I saw the pix for the new upcoming coaster, looks like fun! Can’t wait to try it too. I’ll just have to live vicariously through pictures until then. Hello Mike and Kathie. 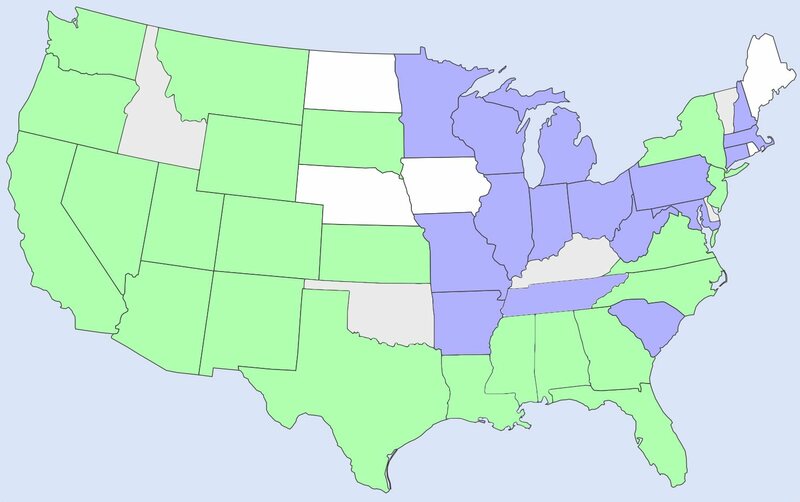 Recently started following your blog. 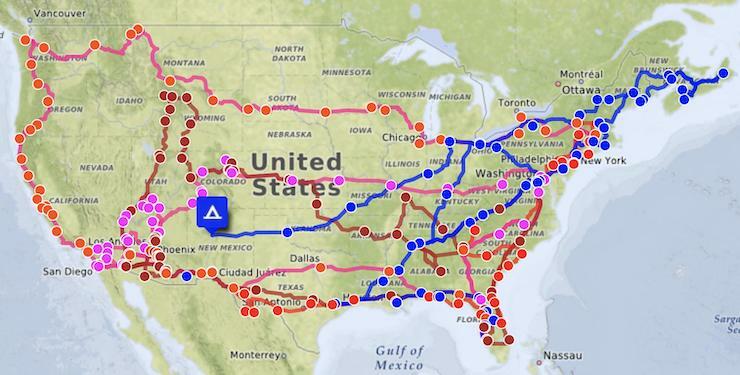 We do not own an RV but we find your travels, and other RVers travels, to be quite interesting. TBH, we are a bit jealous. It sounds like a wonderful fit for my wife and I who have never felt too attached to our homebase. Hi Jesse and Michelle. I’m so glad you found our blog. Not being too attached to home, you two sound like perfect candidates to RV. :) You can always try renting one for a little while and see how you like it. Honestly, we love this lifestyle. 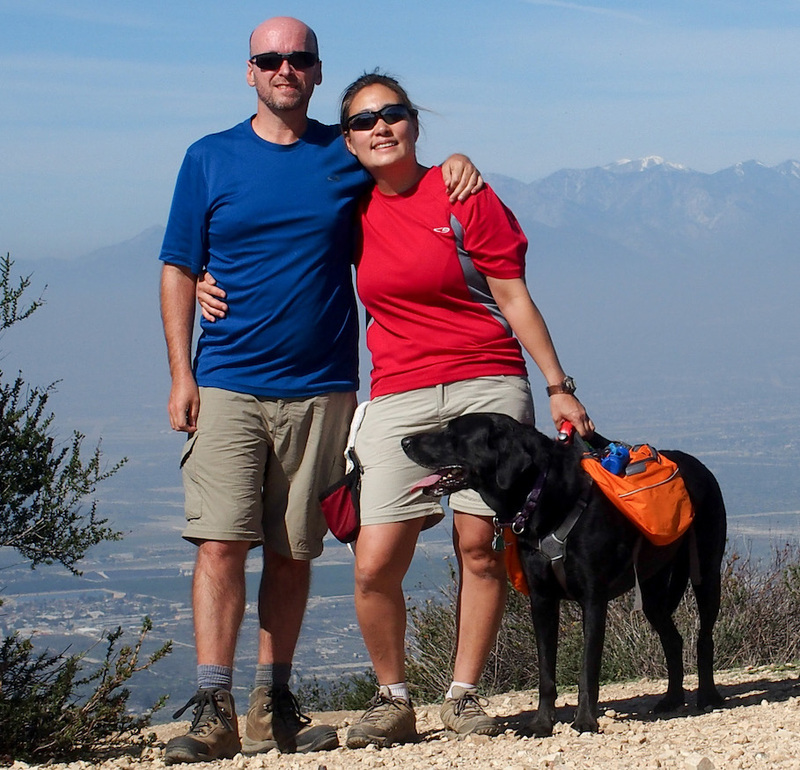 We visit places we’ve never seen before, see some amazing sites, and meet new people. I do hope you enjoy our posts and someday decide to take the plunge too!